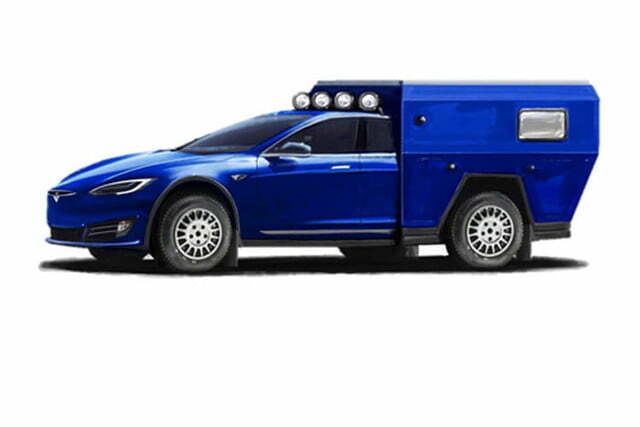 An experimental Tesla Model S converted into a motor home will headline an April 17 event organized by the state of Michigan to promote electric and hybrid cars. The zero-emissions camper is the brainchild of world-traveling author Travis Rabenberg. So far, Rabenberg has only released a pair of computer-generated images of his Tesla hotel. It takes little more than a quick glance at it to tell the Model S has undergone extensive modifications. The most obvious change is the camper box that replaces the sedan’s rear end. The top part of it pops up, Westfalia-style, to reveal a roof-mounted tent. There is also a sizable solar panel on the top, presumably to power accessories like the A/C. The updates don’t stop there. It looks like the Model S has received a suspension lift, and it rides on beefy off-road tires wrapped around aftermarket alloy wheels. Roof-mounted spotlights illuminate the road ahead when the stock LEDs aren’t enough, giving us a glimpse at what a rally-spec Tesla would look like. There’s no word yet on which Model S variant Rabenberg started with, but he hopes the motor home will achieve 150 mph and travel for up to 200 miles on a single charge. The camper box adds weight and reduces sedan’s drag coefficient, so 200 miles is an impressive achievement. 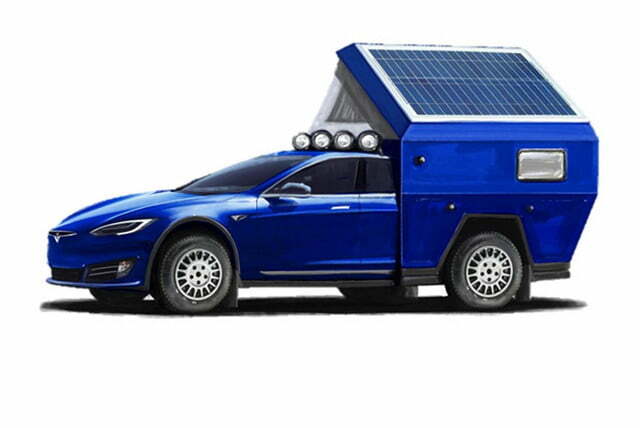 Why go through the trouble of turning an electric luxury sedan into a motor home? According to a statement released by the state of Michigan, Rabenberg hopes to break the Guinness-certified land speed record for an electric motorhome. Reaching 150 mph should help him achieve that goal, and his Tesla might even become the quickest motorhome regardless of powertrain type, but he hasn’t revealed where or when the test will take place yet. Rabenberg’s electric motorhome is still at the prototype stage. When it’s complete, it will embark on an epic trip between an unspecified location in England and Dubai in the United Arab Emirates (UAE), where it will lead a parade of electric cars into the World Expo 2020. That’s at least a 4,500-mile, 71-hour drive, but the good news is Rabenberg won’t need to worry about finding a place to sleep.